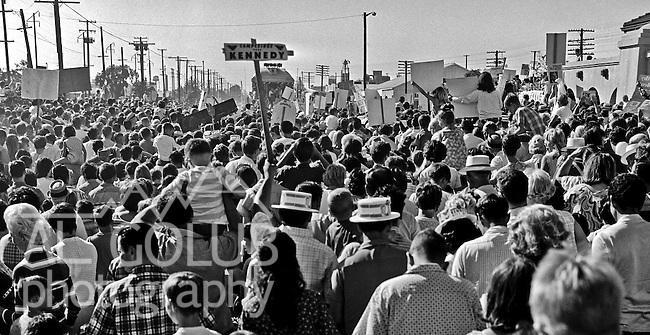 Modesto California, May 30th 1968.."RFK San Joaquin Daylight Special." --RFK came through Modesto with his wife days before he was shot. Robert Francis "Bobby" Kennedy (November 20, 1925 - June 6, 1968), also called RFK, was the United States Attorney General from 1961 to 1964 and a US Senator from New York from 1965 until his assassination in 1968. He was one of US President John F. Kennedy's younger brothers, and also one of his most trusted advisors and worked closely with the president during the Cuban Missile Crisis. He also made a significant contribution to the African-American Civil Rights Movement. .Photo by Al GOLUB/Golub Photography.